This is your chance to Discover, Create and Explore at The Craft Gallery in West Palm Beach! From beginners to experienced artist, everyone is welcome. The Summer Special offers four classes for the price of three! Use found ingredients to make wax textures and patterns, learn about encaustic art and pottery as well as fused glass and lost wax glass techniques. This is the perfect place for a birthday party, where everyone goes home with special memories and someone thing they made themselves! Kiln rentals are also available! The Rickie Report shares the details and some photos. at The Craft Gallery ! Beginner to experienced artists are welcome. These elements are everywhere, especially in art. Discover how to combine these rich “ingredients” to create beautiful works of art. Using rust in surfaces treatments combined with vibrant layers of warm encaustic wax colors and mixed media patterns gives a wonderful look to your art creation. Bring ideas/sketches/photos from home and favorite places that inspire you. We will create on boards, using various mixed media techniques. Enjoy while you explore the wonderful surfaces that inspire you. Warm encaustic wax basics, mark-making, writing into wax, carving and scraping back layers, mono-printing with wax. Mixed media techniques (all compatible with wax): graphite/pigment/oil pastel “rubs”, rusting surfaces, impressions with found objects, embedding small found objects, use of alcohol and water-based inks. Making texture using the following: wax, wall spackle, paper, lace, cheesecloth, sand, shells, string, dried plants and etc. The Craft Gallery artists also teach Fused Glass workshops, Making hand pulled glass stringers and Lost wax cast glass. Hand-building and Wheel throwing Pottery classes. Workshops in Jewelry, Enameling, Silver clay and Polymer Clay Workshops. Or have a group party and make or paint pottery! Call now to enjoy a class for one hour for $35. Experience and have FUN creating your own art TODAY! Great place to buy your clay, tools, glazes, kilns and encaustic wax supplies. We also rent our kilns for your personal firing needs. Visit the Dixie Art Loft to see the latest creations! Visit our other gallery location: Artisans On The Ave in Lake Worth! Located on Lake Avenue in the heart of downtown Lake Worth, Artisans on the Ave is one of those galleries you’ll come back to time and again. 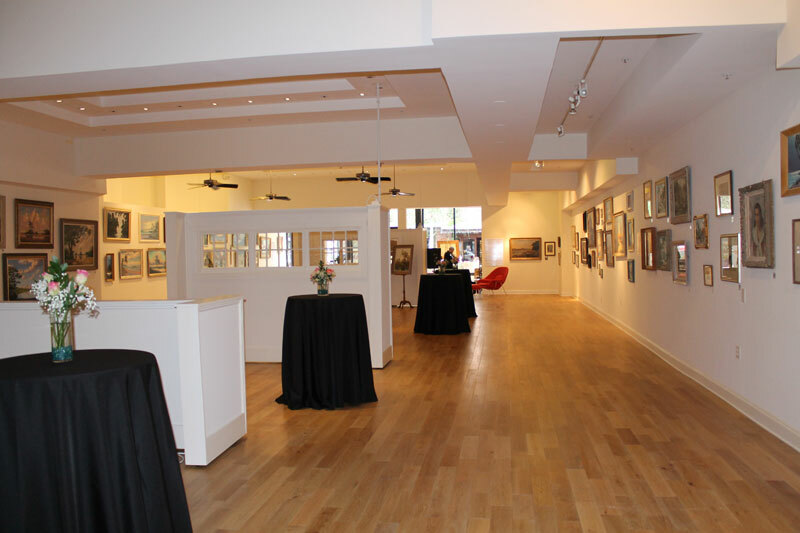 Once you wander inside this gallery, you are immediately engaged as you meander through the three rooms brimming with amazing art from 40 local artists. There are ceramic faces and figures that catch your eye as well as mixed media pieces which incorporate basketry, pieces of nature and a myriad of found objects. You’ll find multiple creations from glass and wood artisans filling the shelves and pottery with unique adornments. Colorful paintings abound and you’ll see many jeweled creations using metal, polymer clay, beads, gemstones, fibers, sea glass and paper. The eclectic nature of the gallery brings in artists from every ilk, including one artist who uses raw wool to create unusual, colorful creatures sure to make you grin. Whether searching for something to adorn your home or looking for a one-of-a-kind gift, this enthralling gallery is THE place to shop. This is an exciting opportunity! Irene Jalowayski will teach a series of classes focused on Fused Glass beginning in January. Not sure what to gift someone? The Rickie Report thinks that this could be it! Irene was featured as an Emerging Artist at Artigras, 2013 and sells her work through a number of local Galleries as well as the Florida Craftsman Gallery in Sarasota,FL. More details are in this article. The Craft Gallery is located on Dixie Highway between Southern and Forest Hill. When you see the big Carvel ice cream cone it is time to turn into the parking lot. You will see The Craft Gallery behind Hair Harbor Beauty Salon and in back of Carvel’s parking lot. It is the season for shopping, bargain hunting and finding those special gifts. The Merchants of Downtown (MOD Squad) of Lake Worth are giving The Rickie Report readers 10 new reasons to shop Lake Worth on Black Friday and Small Business Saturday. More details about sales and events are in this article. Small towns often suffer during the holiday season, deserted by the masses for the large malls; lured by glossy ads and non-stop commercials. The Merchants and Restaurants of Downtown Lake Worth (The MOD Squad) are fighting back. Downtown Lake Worth vows to take back the crowds with extraordinary wares, great pricing, quality merchandise and exceptional food and entertainment. Stop by The Bees Knees! 1. You pay local merchant prices rather than the high mark-ups of the malls. Most of shops are mom and pop owned. 2. There are unique, one of a kind gifts rather than the mass-produced products one sees coming and going; those gifts that are everywhere and on every commercial. Our gifts stand out as special. 3. You will find Artist-run galleries with affordable works of art for the home, the table, to wear and to admire. Works of art direct from the artist to you. 4. Specialty shops abound with gifts from all over the world and gifts made right here in the United States. Teas, soaps, jewelry, toys, costumes, decorations, chocolates, clothing. Find unusual gifts for your pets as well. 5. Forget the food courts with their unhealthy trans-fat foods. Lake Worth has bakeries, café after café and restaurant after restaurant for you to stop into, rest your weary toes and gear up for another round of shopping. 6. Stop for a music break on the streets as each corner has local musicians, from folk to blues to jazz to Caribbean drumming. Have your caricature painted, or watch artists as they create unique works. 7. Lake Worth is known for its shops filled with collectables and antiques. They come in every price range. For decades folks have been discovering Lake Worth and its unusual antiquing experience. 8. Tis the holiday season to wander through an Americana, Old Fashioned town. Window shop, enjoy the competition between shop keepers to make their window the most festive, see a wonderful movie, visit the theater and feel like you have fallen into a modern day Norman Rockwell painting. 9. Parking is ample and free with four hour limits during the day and unlimited late afternoon and evenings. Bring your treasures to the car and go back for more. Lake Worth has a great Sheriff’s Department patrolling and protecting your purchases. 10. You pockets will have plenty of green protruding when you leave the scene. Use that to take the kids to the beach! Come and Shop at the Carousel! The Merchants of Downtown Lake Worth is a group that meets weekly to make Downtown Lake Worth a welcoming destination for neighbors and visitors alike. The MOD Squad, as they fondly refer to themselves, organizes block by block bringing activity, unity and camaraderie to the Downtown corridor. For additional information contact JClay6@aol.com. What happens when a grassroots movement brings artists from different associations, guilds, and galleries together? ART SYNERGY! The Rickie Report has written previously about the “Think Tank” meetings that began in May, 2013. With the visionary leadership of a few and the voices of many, we are excited to share ART SYNERGY, which will be part of Art Palm Beach in January, 2014! There are many opportunities for artists, galleries and groups to become involved. Read this article for more details! Lee Ann Lester, Organizer of ArtPalmBeach Contemporary Art Fair, announced today the launch of the first “Art Synergy” Art Week during the upcoming ArtPalmBeach art fair. “ART SYNERGY is a countywide movement to unify and promote the diverse culture of our vibrant arts community”, explained Craig McInnis, West Palm Beach Art District Coordinator. Initiated by Lee Ann Lester, Fair Organizer and local gallery owners Rolando Barrero, Craig McInnis, and Freddy Hennevelt; “Art Synergy” is a coordinated five day event with over 60 galleries, studios, non-profit art exhibition institutions and museums in six art districts throughout Palm Beach County during the five day fair, Jan. 23-28th. The first evening of Art Synergy begins at ART al’ FRESCO at the Boynton Beach Art District, on January 24th 7pm – 1am. ART al’ FRESCO will feature “Sensabilities: Cheryl Maeder and Ali Miranda” at the ActivistArtistA Gallery, a walking tour of the Murals of the Bay Gates Projects, special performances and showcasing of work by local area artists. Each art district will offer a weekend of scheduled gallery walks, symposiums, open studio visits, special exhibitions, poetry readings, architectural tours, film previews, and art performances. ArtPalmBeach is the most recognized international contemporary art fair held in the Palm Beach County Convention Center established by the IFAE LLC a Florida based art fair organizer. IFAE produces both ArtPalmBeach established in 1997 and The American International Fine Art Fair Palm Beach February 4-9, 2014 established in 1996. IFAE is celebrating its 25th year as an international fair organizer founded by Lee Ann and David Lester. The company has organized over 100 international art fairs in Chicago, New York, Miami, Hong Kong, London, Los Angeles, Dallas and Palm Beach. IFAE LLC is now based in Miami and Palm Beach. In addition to the two Palm Beach fairs the firm organizes Miami International Art Fair, Miami Art + Design Fair, Art Sarasota, Miami International Jewelry Fair and The Club at SeaFair events in conjunction with Show Management Yacht Shows in Ft. Lauderdale, Miami Beach and Palm Beach. Take your friends, neighbors and family to Lake Worth this Saturday for a special event. The Centennial Committee of Lake Worth has planned many events for us to celebrate with this artist haven. This Saturday, March 9th from 11 – 4, you can take a self-guided tour beginning in Downtown Lake Worth. Participating galleries and cultural stops are offering freebies and specials. Bruce Webber Gallery is hosting an exhibit, “Florida, Back in the Day” featuring prominent Palm Beach artist, Bill Benjamin. The Rickie Report hopes to see you there! The Bruce Webber Gallery joins in the celebration of the 500th Anniversary of the State of Florida and the centennial of the City of Lake Worth with an exhibit of paintings by Palm Beach artist Bill Benjamin. Exhibit continues through March 23rd. Bill Benjamin grew up in Palm Beach, the eldest son of William Benjamin, II, of Southampton and New York and Odette de Bruniere, of Paris, France. Bill’s mother was an accomplished artist. Besides his parents’ encouragement and his mother’s example, Bill counts his education at the Choate School and particularly the Cosnard course on the history of French art as major early influences of his lifelong interest in the Impressionist style of painting. After studying Fine Arts at Tulane University in New Orleans, Bill worked primarily in the marine construction industry, including a year spent in Hawaii at the Naval Base in Pearl Harbor. The Eighties saw Bill’s return to Palm Beach and his art career, which was well received within the community, with gallery shows and many private and commercial clients for both works in oil on canvas and murals, particularly featured in Jennifer Ash’s book, ‘Private Palm Beach’. Bill’s paintings feature prominently his interest in plein air and marine subjects with an impressionist flair. Please join us for this nostalgic exhibit of old Florida. For more information contact:www.webbergallery.com or call 561-582-1045. The Stonzek Theatre which will host an open house from 11:00 AM – 1:00 PM with short films and fun cartoons on screen. Chafin Music will feature an exhibit of posters created specifically for Chafin Music Center by school aged children. The Bruce Webber Gallery will feature an exhibit of paintings by Palm Beach Artist Bill Benjamin entitled; Florida, Back in the Day.